Structure of the epoxide group, a reactive functional group present in all epoxy resins. Epoxy is either any of the basic components or the cured end products of epoxy resins, as well as a colloquial name for the epoxide functional group. Epoxy resins, also known as polyepoxides, are a class of reactive prepolymers and polymers which contain epoxide groups. Epoxy resins may be reacted (cross-linked) either with themselves through catalytic homopolymerisation, or with a wide range of co-reactants including polyfunctional amines, acids (and acid anhydrides), phenols, alcohols and thiols (usually called mercaptans). These co-reactants are often referred to as hardeners or curatives, and the cross-linking reaction is commonly referred to as curing. Reaction of polyepoxides with themselves or with polyfunctional hardeners forms a thermosetting polymer, often with favorable mechanical properties and high thermal and chemical resistance. Epoxy has a wide range of applications, including metal coatings, use in electronics/electrical components/LEDs, high tension electrical insulators, paint brush manufacturing, fiber-reinforced plastic materials and structural adhesives. 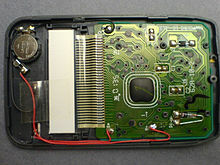 Epoxy is sometimes used as a glue (see image at right). A wide range of epoxy resins are produced industrially. The raw materials for epoxy resin production are today largely petroleum derived, although some plant derived sources are now becoming commercially available (e.g. plant derived glycerol used to make epichlorohydrin). Epoxy resins are polymeric or semi-polymeric materials or an oligomer, and as such rarely exist as pure substances, since variable chain length results from the polymerisation reaction used to produce them. High purity grades can be produced for certain applications, e.g. using a distillation purification process. One downside of high purity liquid grades is their tendency to form crystalline solids due to their highly regular structure, which then require melting to enable processing. An important criterion for epoxy resins is the epoxide group content. This is correctly expressed as the specific amount of substance of epoxide groups in the material B under consideration, calculated as the ratio of the amount of substance of epoxide groups in this material B, n(EP), divided by the mass m(B) of the material B under consideration, in this case, the mass of the resin. The SI unit for this quantity is "mol/kg", or multiples thereof. Several deprecated quantities are still in use, including the so-called "epoxide number", which is not a number and should therefore not be referred to as such, but instead is the ratio of the amount of substance of epoxide groups, n(EP), and the mass m(B) of the material B, with the SI unit "mol/kg". The inverse of the epoxide number is called the "epoxide equivalent weight", which is the ratio of the mass of a sample B of the resin and the amount of substance of epoxide groups present in that sample B, with the SI unit "kg/mol", and is likewise a deprecated quantity. The specific amount of substance of epoxide groups is used to calculate the mass of co-reactant (hardener) to use when curing epoxy resins. Epoxies are typically cured with stoichiometric or near-stoichiometric quantities of curative to achieve maximum physical properties. As with other classes of thermoset polymer materials, blending different grades of epoxy resin, as well as use of additives, plasticizers or fillers is common to achieve the desired processing or final properties, or to reduce cost. Use of blending, additives and fillers is often referred to as formulating. Increasing the ratio of bisphenol A to epichlorohydrin during manufacture produces higher molecular weight linear polyethers with glycidyl end groups, which are semi-solid to hard crystalline materials at room temperature depending on the molecular weight achieved. This route of synthesis is known as the "taffy" process. More modern manufacturing methods of higher molecular weight epoxy resins is to start with liquid epoxy resin (LER) and add a calculated amount of bisphenol A and then a catalyst is added and the reaction heated to circa 160 °C (320 °F). This process is known as "advancement". There are numerous patents and articles on this process which has been popular for over 20 years. As the molecular weight of the resin increases, the epoxide content reduces and the material behaves more and more like a thermoplastic. Very high molecular weight polycondensates (ca. 30 000 – 70 000 g/mol) form a class known as phenoxy resins and contain virtually no epoxide groups (since the terminal epoxy groups are insignificant compared to the total size of the molecule). These resins do however contain hydroxyl groups throughout the backbone, which may also undergo other cross-linking reactions, e.g. with aminoplasts, phenoplasts and isocyanates. Bisphenol F may undergo epoxy resin formation in a similar fashion to bisphenol A. These resins typically have lower viscosity and a higher mean epoxy content per gramme than bisphenol A resins, which (once cured) gives them increased chemical resistance. A related class is cycloaliphatic epoxy resin, which contains one or more cycloaliphatic rings in the molecule (e.g. 3,4-epoxycyclohexylmethyl-3,4-epoxycyclohexane carboxylate). This class also displays lower viscosity at room temperature, but offers significantly higher temperature resistance than the aliphatic epoxy diluents. However, reactivity is rather low compared to other classes of epoxy resin, and high temperature curing using suitable accelerators is normally required. As aromaticity is not present in these materials as it is in Bisphenol A and F resins, the UV stability is considerably improved. Epoxy resins diluents are typically formed by glycidylation of aliphatic alcohols or polyols. The resulting materials may be monofunctional (e.g. dodecanol glycidyl ether), difunctional (butanediol diglycidyl ether), or higher functionality (e.g. trimethylolpropane triglycidyl ether). These resins typically display low viscosity at room temperature (10-200 mPa.s) and are often referred to as reactive diluents. They are rarely used alone, but are rather employed to modify (reduce) the viscosity of other epoxy resins. This has led to the term ‘modified epoxy resin’ to denote those containing viscosity-lowering reactive diluents. Glycidylamine epoxy resins are higher functionality epoxies which are formed when aromatic amines are reacted with epichlorohydrin. Important industrial grades are triglycidyl-p-aminophenol (functionality 3) and N,N,N′,N′-tetraglycidyl-bis-(4-aminophenyl)-methane (functionality 4). The resins are low to medium viscosity at room temperature, which makes them easier to process than EPN or ECN resins. This coupled with high reactivity, plus high temperature resistance and mechanical properties of the resulting cured network makes them important materials for aerospace composite applications. While some epoxy resin/ hardener combinations will cure at ambient temperature, many require heat, with temperatures up to 150 °C being common, and up to 200 °C for some specialist systems. Insufficient heat during cure will result in a network with incomplete polymerisation, and thus reduced mechanical, chemical and heat resistance. Cure temperature should typically attain the glass transition temperature (Tg) of the fully cured network in order to achieve maximum properties. Temperature is sometimes increased in a step-wise fashion to control the rate of curing and prevent excessive heat build-up from the exothermic reaction. Epoxy resin may be reacted with itself in the presence of an anionic catalyst (a Lewis base such as tertiary amines or imidazoles) or a cationic catalyst (a Lewis acid such as a boron trifluoride complex) to form a cured network. This process is known as catalytic homopolymerisation. The resulting network contains only ether bridges, and exhibits high thermal and chemical resistance, but is brittle and often requires elevated temperature for the curing process, so finds only niche applications industrially. Epoxy homopolymerisation is often used when there is a requirement for UV curing, since cationic UV catalysts may be employed (e.g. for UV coatings). Polyfunctional primary amines form an important class of epoxy hardeners. Primary amines undergo an addition reaction with the epoxide group to form a hydroxyl group and a secondary amine. The secondary amine can further react with an epoxide to form a tertiary amine and an additional hydroxyl group. Kinetic studies have shown the reactivity of the primary amine to be approximately double that of the secondary amine. Use of a difunctional or polyfunctional amine forms a three-dimensional cross-linked network. Aliphatic, cycloaliphatic and aromatic amines are all employed as epoxy hardeners. Amine type hardeners will alter both the processing properties (viscosity, reactivity) and the final properties (mechanical, temperature and heat resistance) of the cured copolymer network. 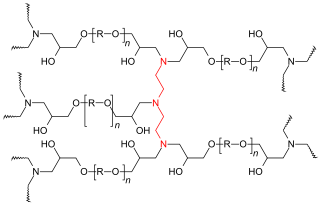 Thus amine structure is normally selected according to the application. Overall reactivity potential for different hardeners can roughly be ordered; aliphatic amines > cycloaliphatic amines > aromatic amines, though aliphatic amines with steric hindrance near the amino groups may react as slowly as some of the aromatic amines. Slower reactivity allows longer working times for processors. Temperature resistance generally increases in the same order, since aromatic amines form much more rigid structures than aliphatic amines. Aromatic amines were widely used as epoxy resin hardeners, due to the excellent end properties when mixed with a parent resin. Over the past few decades concern about the possible adverse health effects of many aromatic amines has led to increased use of aliphatic or cycloaliphatic amine alternatives. Polyphenols, such as bisphenol A or novolacs can react with epoxy resins at elevated temperatures (130-180 °C 266-356 °F), normally in the presence of a catalyst. The resulting material has ether linkages and displays higher chemical and oxidation resistance than typically obtained by curing with amines or anhydrides. Since many novolacs are solids, this class of hardeners is often employed for powder coatings. Also known as mercaptans, thiols contain a sulfur which reacts very readily with the epoxide group, even at ambient or sub-ambient temperatures. While the resulting network does not typically display high temperature or chemical resistance, the high reactivity of the thiol group makes it useful for applications where heated curing is not possible, or very fast cure is required e.g. for domestic DIY adhesives and chemical rock bolt anchors. Thiols have a characteristic odour, which can be detected in many two-component household adhesives. Condensation of epoxides and amines was first reported and patented by Paul Schlack of Germany in 1934. Claims of discovery of bisphenol-A-based epoxy resins include Pierre Castan in 1943. Castan's work was licensed by Ciba, Ltd. of Switzerland, which went on to become one of the three major epoxy resin producers worldwide. Ciba's epoxy business was spun off as Vantico in the late 1990s, which was subsequently sold in 2003 and became the Advanced Materials business unit of Huntsman Corporation of the United States. In 1946, Sylvan Greenlee, working for the Devoe & Raynolds Company, patented resin derived from bisphenol-A and epichlorohydrin. Devoe & Raynolds, which was active in the early days of the epoxy resin industry, was sold to Shell Chemical; the division involved in this work was eventually sold, and via a series of other corporate transactions is now part of Hexion Inc.. The applications for epoxy-based materials are extensive and include coatings, adhesives and composite materials such as those using carbon fiber and fiberglass reinforcements (although polyester, vinyl ester, and other thermosetting resins are also used for glass-reinforced plastic). The chemistry of epoxies and the range of commercially available variations allows cure polymers to be produced with a very broad range of properties. In general, epoxies are known for their excellent adhesion, chemical and heat resistance, good-to-excellent mechanical properties and very good electrical insulating properties. Many properties of epoxies can be modified (for example silver-filled epoxies with good electrical conductivity are available, although epoxies are typically electrically insulating). Variations offering high thermal insulation, or thermal conductivity combined with high electrical resistance for electronics applications, are available. Two part epoxy coatings were developed for heavy duty service on metal substrates and use less energy than heat-cured powder coatings. These systems provide a tough, protective coating with excellent hardness. One part epoxy coatings are formulated as an emulsion in water, and can be cleaned up without solvents. Epoxy coatings are often used in industrial and automotive applications since they are more heat resistant than latex-based and alkyd-based paints. Epoxy paints tend to deteriorate, known as "chalking out", due to UV exposure. Polyester epoxies are used as powder coatings for washers, driers and other "white goods". Fusion Bonded Epoxy Powder Coatings (FBE) are extensively used for corrosion protection of steel pipes and fittings used in the oil and gas industry, potable water transmission pipelines (steel), and concrete reinforcing rebar. Epoxy coatings are also widely used as primers to improve the adhesion of automotive and marine paints especially on metal surfaces where corrosion (rusting) resistance is important. Metal cans and containers are often coated with epoxy to prevent rusting, especially for foods like tomatoes that are acidic. Epoxy resins are also used for decorative flooring applications such as terrazzo flooring, chip flooring, and colored aggregate flooring. Epoxies were modified in a variety of ways, Reacted with fatty acids derived from oils to yield epoxy esters, which were cured the same way as alkyds . Typical ones were L8(80% linseed, D4 (40% Dehydrated castor oil). These were often reacted with styrene to make styrenated epoxy esters, used as primers. Curing with phenolics to make drum linings, curing esters with amine resins and pre-curing epoxies with amino resins to make resistant top coats. One of the best examples was a system of using solvent free epoxies for priming ships during construction, this used a system of hot airless spray with premixing at the head. This obviated the problem of solvent retention under the film, which caused adhesion problems later on. Epoxy adhesives are a major part of the class of adhesives called "structural adhesives" or "engineering adhesives" (that includes polyurethane, acrylic, cyanoacrylate, and other chemistries.) These high-performance adhesives are used in the construction of aircraft, automobiles, bicycles, boats, golf clubs, skis, snowboards, and other applications where high strength bonds are required. Epoxy adhesives can be developed to suit almost any application. They can be used as adhesives for wood, metal, glass, stone, and some plastics. They can be made flexible or rigid, transparent or opaque/colored, fast setting or slow setting. Epoxy adhesives are better in heat and chemical resistance than other common adhesives. In general, epoxy adhesives cured with heat will be more heat- and chemical-resistant than those cured at room temperature. The strength of epoxy adhesives is degraded at temperatures above 350 °F (177 °C). Epoxy systems are used in industrial tooling applications to produce molds, master models, laminates, castings, fixtures, and other industrial production aids. This "plastic tooling" replaces metal, wood and other traditional materials, and generally improves the efficiency and either lowers the overall cost or shortens the lead-time for many industrial processes. Epoxies are also used in producing fiber-reinforced or composite parts. They are more expensive than polyester resins and vinyl ester resins, but usually produce stronger and more temperature-resistant thermoset polymer matrix composite parts. A growing use of epoxy resins is in the fabrication of wind turbine blades. Epoxy resin formulations are important in the electronics industry, and are employed in motors, generators, transformers, switchgear, bushings, insulators, printed wiring boards (PWB), and semiconductor encapsulants. Epoxy resins are excellent electrical insulators and protect electrical components from short circuiting, dust and moisture. In the electronics industry epoxy resins are the primary resin used in overmolding integrated circuits, transistors and hybrid circuits, and making printed circuit boards. The largest volume type of circuit board—an "FR-4 board"—is a sandwich of layers of glass cloth bonded into a composite by an epoxy resin. 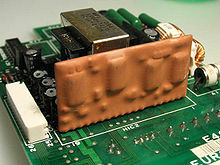 Epoxy resins are used to bond copper foil to circuit board substrates, and are a component of the solder mask on many circuit boards. Water-soluble epoxies such as Durcupan are commonly used for embedding electron microscope samples in plastic so they may be sectioned (sliced thin) with a microtome and then imaged. Epoxy resin, mixed with pigment, may be used as a painting medium, by pouring layers on top of each other to form a complete picture. It is also used in jewelry, as a doming resin for decorations and labels, and in decoupage type applications for art, countertops, and tables. These commodity epoxy manufacturers mentioned above typically do not sell epoxy resins in a form usable to smaller end users, so there is another group of companies that purchase epoxy raw materials from the major producers and then compounds (blends, modifies, or otherwise customizes) epoxy systems from these raw materials. These companies are known as "formulators". The majority of the epoxy systems sold are produced by these formulators and they comprise over 60% of the dollar value of the epoxy market. There are hundreds of ways that these formulators can modify epoxies—by adding mineral fillers (talc, silica, alumina, etc. ), by adding flexibilizers, viscosity reducers, colorants, thickeners, accelerators, adhesion promoters, etc. These modifications are made to reduce costs, to improve performance, and to improve processing convenience. As a result, a typical formulator sells dozens or even thousands of formulations—each tailored to the requirements of a particular application or market. The primary risk associated with epoxy use is often related to the hardener component and not to the epoxy resin itself. Amine hardeners in particular are generally corrosive, but may also be classed as toxic or carcinogenic/mutagenic. Aromatic amines present a particular health hazard (most are known or suspected carcinogens), but their use is now restricted to specific industrial applications, and safer aliphatic or cycloaliphatic amines are commonly employed. Liquid epoxy resins in their uncured state are mostly classed as irritant to the eyes and skin, as well as toxic to aquatic organisms. Solid epoxy resins are generally safer than liquid epoxy resins, and many are classified non-hazardous materials. One particular risk associated with epoxy resins is sensitization. The risk has been shown to be more pronounced in epoxy resins containing low molecular weight epoxy diluents. Exposure to epoxy resins can, over time, induce an allergic reaction. Sensitization generally occurs due to repeated exposure (e.g. through poor working hygiene or lack of protective equipment) over a long period of time. Allergic reaction sometimes occurs at a time which is delayed several days from the exposure. Allergic reaction is often visible in the form of dermatitis, particularly in areas where the exposure has been highest (commonly hands and forearms). Epoxy use is a main source of occupational asthma among users of plastics. Bisphenol A, which is used to manufacture a common class of epoxy resins, is a known endocrine disruptor. ^ Clayton May (11 May 2018). Epoxy Resins: Chemistry and Technology (Second Edition). CRC Press. p. 65. ISBN 978-1-351-44995-3. Epoxies are the resins most commonly employed for electrical and electronic applications. Selection of epoxies is based on their superior adhesion, permeability, purity, and corrosion- and stress-resistance properties. ^ "Epoxy resin mixtures containing advancement catalysts" (PDF). freepatentsonline.com. Retrieved 2018-08-29. ^ P. Schlack, I. G. Farbenindustrie, German Patent 676 117 (1938), US Patent 2 136 928 (1938). ^ "History of Epoxy Resin". epoxyflooringtech.com. ^ May, Clayton A. (1987-12-23). Epoxy Resins: Chemistry and Technology (Second ed.). New York: Marcel Dekker Inc. p. 794. ISBN 0-8247-7690-9. ^ Morena, John J (1988). Advanced Composite Mold Making. New York: Van Nostrand Reinhold Co. Inc. pp. 124–125. ISBN 978-0-442-26414-7. ^ "Technical Advances in Epoxy Technology for Wind Turbine Blade Fabrication" (PDF). ^ Hakiki, F., Nuraeni, N., Salam, D.D., Aditya, W., Akbari, A., Mazrad, Z.A.I. and Siregar, S. Preliminary Study on Epoxy-Based Polymer for Water Shut-Off Application. Paper IPA15-SE-025. Proceeding of The 39th IPA Conference and Exhibition, Jakarta, Indonesia, May 2015. ^ Stäubli, W. (1963). "A new embedding technique for electron microscopy, combining a water-soluble epoxy resin (Durcupan) with water-insoluble Araldite" (PDF). The Journal of Cell Biology. Rockefeller Univ Press. 16 (1): 197. doi:10.1083/jcb.16.1.197. PMC 2106182. ^ Kushida, H. (1963). "A Modification of the Water-miscible Epoxy Resin "Durcupan" Embedding Method for Ultrathin Sectioning". Journal of Electron Microscopy. Japan Society Microscopy. 12 (1): 72. ^ Luft, J.H. (1961). "Improvements in epoxy resin embedding methods" (PDF). The Journal of Biophysical and Biochemical Cytology. 9 (2). Rockefeller Univ Press. p. 409. ^ McCreight, Tim; Bsullak, Nicole (2001). Color on Metal: 50 Artists Share Insights and Techniques. Guild Pub. ISBN 978-1-893164-06-2. Look up epoxy in Wiktionary, the free dictionary. This page was last edited on 18 April 2019, at 20:59 (UTC).